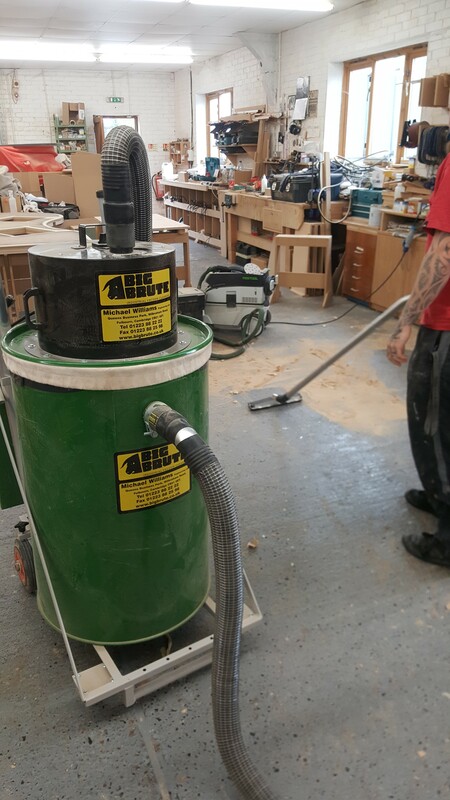 Knotty Ash Woodworking Ltd, of Great Chesterford, have thrown away their brooms and are benefiting from a cleaner working environment with their Big Brute HEPA Industrial Vacuum Cleaner. Knotty Ash Woodworking Ltd manufacture high-end custom technical furniture for the broadcast, studio, office and security industries. They were using brooms to clean up their workshops and recognised that a vacuum cleaner would deal far better with the fine dusts that sweeping stirs up into the air and often leaves behind. Andy Brewer, the Co-Managing Director, explained that they had looked on the web for industrial vacuum cleaners and, having found the Big Brutes, realised we were very local to them. We recommended a Big Brute HEPA (High Efficiency Particle Arrester) with a Floor, Wall and Ceiling Toolkit. The Big Brute HEPA’s filtration meets the requirements for sucking up hard- and soft-wood dusts and is ideally suited for cleaning in joinery workshops. The Floor, Wall and Ceiling Toolkit has all the tools you need to clean every inch of your workshop, including under and around machinery, and up high to clean walls and window ledges where dust can often settle. Andy was very pleased with the results the Big Brute gave straight away – cleaning up was faster and the end result was far better. “I didn’t realise how much dust was left behind using a broom,” Andy told us. “When we use the Big Brute, there’s no dust left”. Knotty Ash Woodworking Ltd’s website has more information on their custom desks and technical furniture for studios, broadcasting and receptions.